All Koolpak Instant Ice Packs are fully compliant with the Medical Devices Directive, unlike many other products on the market. To be used for therapeutic purposes Instant Ice Packs must be certified as Class IIa medical devices and accredited to ISO9001: 2016 and ISO13485: 2016. as required by the Medicines & Healthcare products Regulatory Agency (MHRA). If an Instant Ice Pack does not show a CE mark and authority number then it is NOT suitable for medical or therapeutic use. A good quality product, easy to use and very effective in combating the pain which follows knee replacement surgery. Far more efficient than having to keep a freezer stocked up with bags of peas! Sciatica. Very good for ease travelling. These are really good, easier to use than a pack of frozen peas! Ideal for travelling. Wife has Arthritis in spine, uses them to get relief, I have neck trouble, an ice pack several times a day gives great relief. Recommend them to our family and friends. Quality perfect. Used for sports matches, great to have in a first aid kit. Good quality. Used for hockey injuries. Recommended to other clubs. Bought for a football team, great quality and value. Ice packs are used for quick treatment of potential muscle strains, ligament damage. Would suggest product to anyone with a sports facility. Cannot comment on product quality as have no experience in the field. The product is for my partner, who is a paramedic and does event work. I would recommend this to anyone in the medical sector - it is a good quality product at a good price. I am secretary of a basketball club with 9 teams, 150 members. Teams use ice packs at training and games for knocks and bruises. Packs are good value for money. Quality is good. Sometimes have to use 2 if pack does not stay cold enough for long enough. used for sports injuries; not used to date, thankfully! Fast deliver great product to receive migraine. Excellent quality and easy to store. Use them all the time for our business. Great 20 pack of instant ice packs for football team first aid kit. Would recommend for sports teams or use at home. Great value for money and next day delivery was ideal. Excellent product. I would recommend this product to everyone who cares for children. Fantastic service from easy ordering to quick delivery. Would definitely recommend. Applied to very sore feet following extensive activity which relieved the burning sensation. Excellent product. We purchased the Koolpaks to add to thr first aid kits on a large youth camp. They are great for instant relief for minor injuries. Snap easily to provide instant cold. Used previously for head bumps, broken toes etc. Sports Therapist for semi pro football team. Good product easy to use. Very effective. excellent for use in the sports field. That is outside away from freezers. Bit difficult to hold in place but very good. Used on a knee injury whilst at work where I have no access to freezer for a conventional ice pack. Ice packs used in first aid. Awesome price and the free covers are a brilliant added bonus. Good for anyone, adult or child. Very versatile. used to bring down inflammation following an ACL reconstruction. recommended for any injury with inflamed tissues. Quality good but portability is excellent - no need to be near a freezer. Does what we want it to. I use these ice packs recommended to me by my sports therapist. They are easy to use and handy for when you're out of the house. Promptly delivered and exactly as advertised. Used by my daughter for a dance injury. Would recommend. Work reasonably well but not as cold as the reusable gel pack. My wife uses the ice packs after knee and hip replacements and have advised others with the same complaints to do the same.We have given them out to try and recommended them to several people. Ice packs are used by our Badminton club. They are used by members when they have encountered muscle injuries. I would recommend these for other clubs to be used for the same purpose or could also be kept at home should an icepack be required in an emergency. A helpful thing to have for emergencies and holidays. Having just had a total knee replacement which tends to swell regularly, I found the Koolpak product a convenient and effective therapy. Excellent service-product as described. Ideal for hockey /lacrosse/tennis playing daughter when she needs it. Post surgery these are great when you return to work and need instant cooling to take swelling down a bit. Don't have freezer at work so I rely on these to get me through the day. Use the items for both Under 12s and Under 18s so get through them quite quickly so important for a quick delivery at a good price and these satisfy both. I bought this product to use on a back injury that gives recurrent problems. The size and convenience of the product make it portable and ready for immediate use when needed. I am a Childminder and use these Koolpak Original Instant Ice Packs when the children and I are out and about incase of the odd accident. I also recently had need to use the packs with my 12 year old niece who is in hospital which is at times unbearably hot. Good product, easily activated and worth the money. To take away to a hot climate.Friends will be told about your product. My wife's Arthritis, after knee operation, they work better than drugs. Good quality product at a good price. Excellent for using fir Netball team as first aid for sprains and breaks injuries. Recommended to manager of local museam. Use it following knee revision surgery. Very effective. I have recommended it to others. Very good product , easily used . I have been using these ice packs for relief of an old trapped nerve injury. Perfect for the work place where no freezers are available for gel packs. used in all our first aid boxes on the property, mainly for trips and falls with children. I have been using koolpak to assist my rehab after a total knee replacement, I don't know what I would have done without them! They did not stay as cold as expected, but were better than nothing, as no freezer available for the usual cool packs used for an inflamed joint. Bought these for my daughter to take on a school camping trip as she suffers from bad legs and needs ice packs at night. Looked at other providers and these were the best value. First class service. Cheapest I could find and they arrived within days. 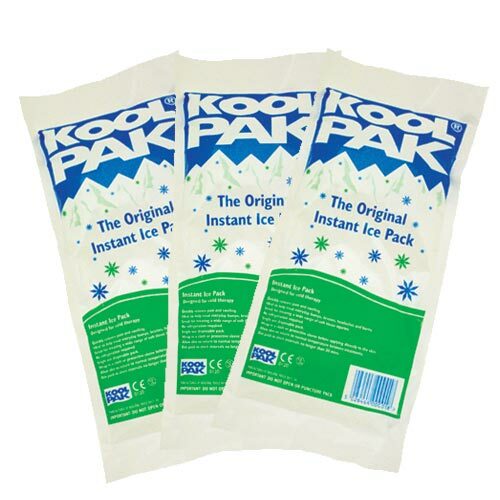 I am on my third box of Koolpak, they have speeded up my total knee replacement recovery! The ice packs are very good and ideal for dealing with bruises/ sprains. The extra large bag enables the pack to cover a bigger area and stay stay inplace with out any extra covering. I have used this product in my work environment with children and in a judo session. They are quick and safe to use. Bought for personal use for home and car. good product. would recommend to other childminders. I use the product with a knee cuff to support the healing of my knee after a full knee replacement. Used to keep a couple in karate kit bag in case of accidents in training. No need to keep refrigerated. Product used to stop nosebleeds in my partner which can be serious as he is on an anticoagulant medication. Very easy to use and reassuring to have packs in our bathroom. Product bought for ankle injury to aid icing at work. Good product, stays cold for 20 mins plus. I will be using them to help recovery from a knee replacement. We use this product on site, in our childrens' activities where we get a lot of bumped heads etc! They go down quick as they are one-use only but worth it. Quick and easy to use in any first aid situation. I think it's a 'must-have' in any first aid box. Really prompt delivery. Ordered one evening and it was delivered the next day! Good for use in school. Easy to use website. Fast and efficient delivery.